Hey everyone, welcome back to my computers and electronics blog. Today I wanted to talk about a game I have been spending a lot of time playing lately. Terraria. Terraria is playable on console, PC, mobile phone and mobile consoles so everyone can play it anyway they want. I recently found a used 3DS online that I am playing on just to experience the different versions. I found some good used consoles at http://www.canada.for-sale.com/ and having all the different versions have really helped with the experience. This is a game that me and my girlfriend are actually playing together, so it is a perfect game for couples or anyone who doesn't want to take games to serious but wants the option to. When you first load up the game, the first thing you will notice is a man walking around aimlessly with a very typical name like Joe or Seth. This is your guide and he will teach you everything about how to survive in this new land. Armed with starter versions of a pickaxe, axe, and sword you are given your first objective; build a house. This task may seem daunting to new players but is really quite simple and the game hold your hand for the most part along the way. You have access to a handful of different building materials from the get go, and once you build your house out of your desired material you can go exploring for more. A big part of this game is mining as you get better weapons, tools and armours from the varying ores found in the game. Once you are using the strongest ores is when things get different and another element of this game steps in for its turn-crafting. Once you go exploring for a while you will most likely stumble across a chest. Inside the chest will be some money, potions and if you're lucky equipment. Equipment is vital in this game as it enhances your character and can make a huge difference. Most good equipment will be crafted which is why I have chests full of every material that exists in the game as you never know when you will have to craft something. The crafting can get very intricate as well, your first set of armour will require a minimal amount of bars of your desired type where as end game armour requires four different armour sets as well as unique endgame materials called souls that are found on dead boss enemies. The strongest sword in the game takes a whopping 10 swords to make, 5 of which cannot be crafted and must be found from either chests throughout the world or enemy drops. But you can also craft simple things, such as threads to make unique clothing and dyes to change your clothing color. It’s the little things like this that can make you spend hours upon hours doing the simplest tasks such as painting furniture. The Terraria wiki has all the recipes if you want to look more at them I would suggest checking them out. 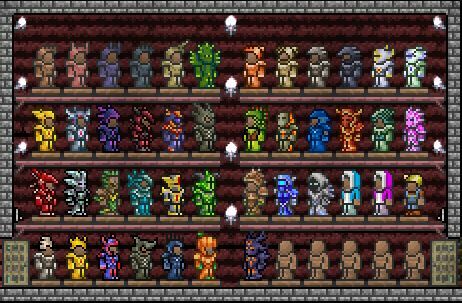 There is so much to make and do in Terraria that you will never run out of things to do. And because of the nature of the games building mechanics, you can change anything at all in the world to fit your liking. Want to have your house surrounded by mountains? You can build them. Want to have a moat of lava? You can dig one. Want to drain all of the water from the ocean into your own personal swimming pool? You sure as hell can do that! The world is your oyster (or shell as the game reads). The only limitations placed on you are your console really. Certain versions get different bosses and items. This revives the Android vs. Apple debate I had on here earlier as they each have their own versions. Having all the versions ensures you can try everything, but at this time unfortunately you can only switch your character between old gen and new gen consoles (Xbox 360 to the Xbox One). It seems that every time I launch Terraria there is something new for me to learn how to use. The constant developer support has really enhanced this game, doubling the amount of goodies you can get and tripling the amount you can make. They also add new elements to the gameplay almost monthly. Since the launch we have had fishing, painting, hair dyes, mine carts, teleporters and so much more added. I still haven’t finished all of the fishing quests, a completely new component to the game which has the player talking to the Wrangler NPC daily to see what fish is required, then travelling to the specified biome to catch said fish. With so much to do and see, this game will keep you busy for hundreds of hours, easy. So Apple →← Sat Nav systems needed anymore?